The legend of The Angels of Mons is quite fascinating. Legend says that a group of angels protected the outnumbered British Army during the Battle of Mons. In Eric Webb's The Angels of Mons, the battalion is an evening away from the infamous fight, as a magical copy of Shakespeare's Henry V appears and the soldiers play pretend to pass the time away before sure fire death. Regardless of the fictional aspects as the focal point as opposed to the historical saga, The Angels of Mons is a World War I era drama about humanity and humility. Borrowing elements from the Shakespeare history, George and his comrades are in hiding and discover a young Belgium boy aptly named Harry. With war surrounding their hideout, George and Harry share niceties and play the roles in Shakespeare’s play. Getting the boys to play along, Henry V is perfectly analyzed until morning comes and war becomes the focus once again. Eric Webb has clearly done his research to make this play accurate. Webb layers in war actualities with a strong knowledge of the Shakespearian source material but there are moments that it comes off as an English class analyzing a text or a strongly written essay rather than a story. Despite this, Webb blends his own poetic voice with Shakespeare. When the characters drop into monologues, Webb’s language is stunning. From a plot perspective, believability is sometimes forgotten. From the small, like Charles’ seemingly devastating injury at the start is ignored as he uses his arm normally, to the large, like the high stakes war surrounding the playful dress-up time, some sacrifices were made for entertainment. Though there were some incredibly strong moments of high stakes, with a long run time, The Angels of Mons could benefit from a trim. The Angels of Mons is a big big story. Depicting war on stage is never an easy task. But a keen eye in the director’s seat is essential. Sadly, director Laura Archer missed the mark. Under St. Marks is a very specific space. It is a very small space for a very large epic. Using Under St. Marks requires skill. Archer didn’t quite grasp its intricacies to utilize it properly. By simply having her company slam the mock door, beer glasses in the space shook, drawing focus and pulling you out of the period piece. For a large portion of the beginning of the play, the staging lacked purpose. The actors seemed to wander the stage with no real sense of course. Creating an ambiance of a war-torn battlefield allows the stakes to be felt. The lighting is inconsistent as time is lost. Though some actors were lost in the shadows, those sacrifices were more believable than the odd brightness of night. With no real set, much of the environment is left to the imagination. But what we are provided on stage were strategically placed rather than found. Specifically the props. Rather than living in a world of war, the props used in the retelling of Henry V were too conveniently placed in a corner with actors pulling their items as if they were in a toy chest. With the limitations of space, finding strong theatrical moments were few and far between. Without spoiling the play, The Angels of Mons ends with laying one of their own to rest. Rather than using the established play items including the sticks to create a cross, Archer had her actor randomly pull a piece of chalk from his pocket and draw a cross on the mock door of Under St. Marks. It’s possible for the audience to emote for the fallen, but it’s also possible that the moment was filled with thoughts on where the chalk came from. The moment stemmed from reality and the existence of the chalk is what I left with. The ensemble of seven did their finest to bring World War 1 to the stage. With each actor picking a different dialect, the accents as a whole showcased imperfection. Quite possibly the strongest character in the piece, Christopher Basile as Burke was also the strongest actor on stage. Basile’s conviction and forte allowed for a well-rounded performance. Ben Stroman as Alfie, the religious nice guy, lacked material but still gave a strong performance. George Hider as the timid nice guy John was loveable. Jeffrey Roth’s sly cockney Peter was a highlight for comic relief. Michael Broadhurst had a lot of weight to carry as the focal point of the play and the leader of the brigade. Broadhurst lacked the command to lead both. 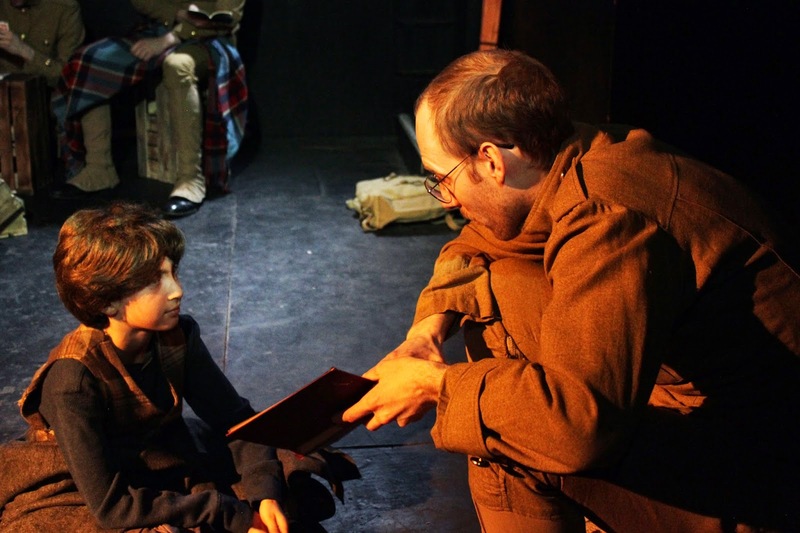 March Forth Productions’ The Angels of Mons was a daring piece of theater. It was woefully the wrong play for the space. Perhaps in a different theater, The Angels of Mons would resonate and give the full perspective of war.